Goal: Set up and run near line-speed 1Gbps traffic using the LANforge Armageddon feature. In this test scenario, LANforge Armageddon is set up to run at about 80,000 packets/second full-duplex to achieve near line-speed 1Gbps traffic generation. 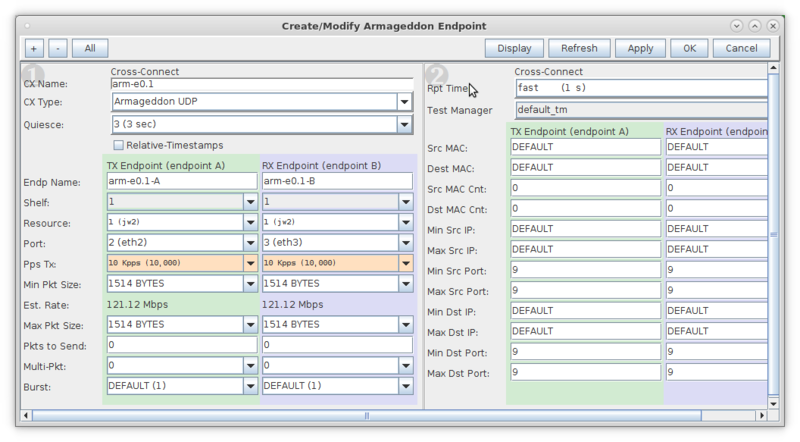 Run the Armageddon cross-connect and view results. It will take a moment for the Armageddon traffic to stabilize. Depending on the hardware, LANforge will settle on an actual rate which may differ from the requested rate. In this example, this system (1.8GHz Intel Atom D525, 6 onboard 10/100/1000 ports) is capable of reaching 81,000pps with 1514byte packets or, an equivalent speed of about 990-1005Mbps bi-directional. NOTE: Delay for Armageddon connections is measured in microseconds (us) and in this example, the system experiences about 39us of delay when sending to itself.